Giraffe Tattoo Design Meanings - The giraffe is a symbol of Africa. Nowhere else on the planet does this most extraordinary creature have a natural home. The nation of Tanzania has adopted the giraffe as one of its official symbols. And if you adopt this remarkable animal as a tattoo motif, it may well be seen as a symbol of your concern for all wildlife in danger of extinction, and of the environment at large. Gentle animal that it is, you are projecting an image of peaceful co-existence. As a spirit guide, the giraffe presents qualities of vision, being able to see in all directions. With its feet on the earth and its head in the sky, the giraffe symbolizes balance gained from its perspective that extends far and wide. Nine different species of giraffe can be found in countries like Somali, Ethiopia, Kenya and Tanzania. 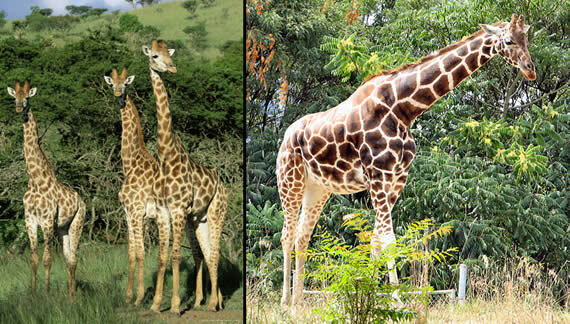 Lanky, long-necked and graceful, they reach where few other creature are able. The tallest of beasts, its neck can reach seven feet in length, and at full height the giraffe stands a full eighteen feet high. 'Sticking your neck out' is a figure of speech that comes to mind when regarding a giraffe. It connotes courage in speaking your truth, but also implies risk. When it needs to stoop low - to drink, for example - the giraffe must spread its feet wide, and in an untamed world of dog-eat-dog, it becomes vulnerable to attack. Male giraffes, in a demonstration of their neck's power and flexibility, engage in bouts of 'neck wrestling', but rarely do each other damage. Though it is generally a docile creature, the giraffe became a symbol associated with military power. In ancient times, it was a gift presented to emperors and kings by ambassadors seeking political favour and prestige. In 14th century Persia, the giraffe was presented as a gift to the conqueror, Tamerlane, by the Sultan of Egypt. A Chinese Emperor once received a giraffe from voyagers returning from Africa, and viewed it as an auspicious symbol, akin to the mythic unicorn. The giraffe was then acknowledged as a symbol of peace and accord between rivals. Julius Caesar, on his triumphant return from Africa in 46 BC, paraded down the streets of Rome in the company of a giraffe and elephant. In medieval Italy, the powerful and ruthless Medici family (in imitation of the great Caesar, perhaps) was portrayed with a giraffe in a famous painting by Vasari. There's a town in Italy called Giraffa, which sports the giraffe as a symbol for its 'contrade'. These were districts, which, in medieval times provided troops for the defense against other hostile city states. The giraffe is depicted being led by a Moor, and can still be seen at contrade festivals celebrating the historic customs and traditions of the old military. 'How the giraffe got its long neck' is a frequent story in African myth and legend, but the scientific community is still working on the conundrum. The obvious explanation is that a long neck allows a creature access to the tender leaves at the top of trees. The giraffe has the added advantage of an extremely long tongue. For African tribes like the Bushmen and the Sotho, the famous constellation in the southern sky isn't the Southern Cross, but a giraffe. When it appears low in the sky, hovering above the tree tops, it's time for the cultivation of crops. Choose your own giraffe tattoo design from Tattoo-Art.com. Find and buy the giraffe tattoo design that's perfect for you.